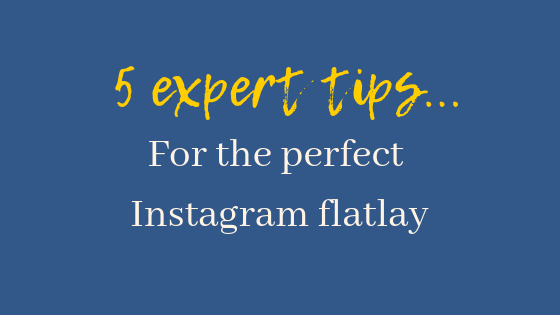 If you’re active on Instagram, you will no doubt have spotted stunning flatlay images from your favourite brands, influencers and bloggers. Carefully constructed and pieced together to perfection, these images (photographed from above) are designed to showcase products, tell a stylish story and wow followers. When combined with Instagram’s latest features (IGTV, stories, highlights, shoppable tags and more), the potential for small businesses is huge. Instagram now has more than 1 billion monthly users*, so it’s time to get creative with your visual content and stand out from the crowd! But, what makes a good flatlay and how can you style beautiful, attention-grabbing images for your business? 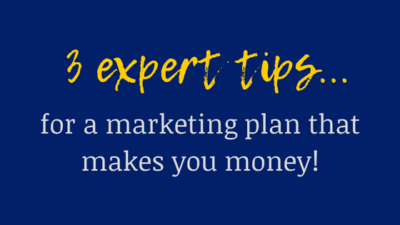 Read on for unmissable tips from the experts. 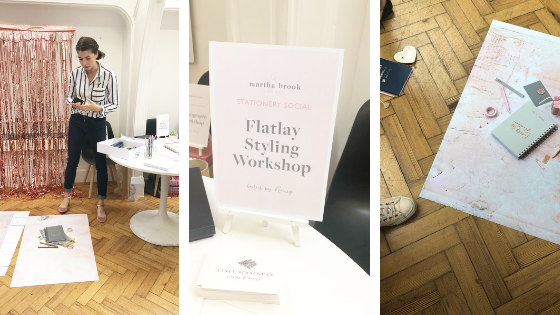 At the weekend I attended Martha Brook London’s first ever stationery social – a magnificent explosion of pretty pastels, delicious canapes and cocktails, sweet treats, stunning flowers and of course, beautiful stationery (with an ‘e’!). During the afternoon, I took part in some brilliant creative workshops including one on flatlay styling for Instagram. This workshop was run by Nancy Straughan, a fabulously talented London-based stylist. Nancy generously shared her top tips and tricks for creating beautiful flatlays – her passion for styling shone through. Nancy taking us through flatlay styling tips. Martha also joined our group to share some invaluable tips for taking and editing the perfect image. If you’ve seen Martha’s Instagram feed, you’ll know just how beautiful her images are (if not, be sure to check it out!). For the perfect image, seeking out good lighting is essential. Set your flatlay up in a spot that has plenty of natural light. But do be careful to avoid full or direct sunlight however as this will create unwanted shadows. Great lighting will get your image off to a really good start! Digitally printed vinyl backdrops are brilliant for setting your props and products up on. They instantly make your images look more professional and Instagram-worthy! Lightweight, durable and available in a range of gorgeous designs, check out Capture by Lucy and find one (or two!) that are perfect for your brand. Don’t be tempted to overcrowd your flatlay with too many items. Aim to have one core point of interest (your ‘hero’ product) and carefully select a number of relevant props to compliment it. Your prop set up should look natural (almost accidental) rather than too contrived or rigid. Turn on the gridlines function on your phone as this will help you snap the perfect image (great tip Martha!). To do this on an iPhone simply go to Settings > Camera > Grid and turn it on. The gridlines will help you play with the composition of your image and create something a little more off-centre/visually appealing. There are many apps for editing images for Instagram but Martha recommended Pic Tap Go, and I am sold! Simple to use and quick to get started with, this nifty app will have your images looking more professional in no time. Among other handy features, you can also store your filters and editing choices to help you create a consistent brand look with each photo. Image edited in Pic Tap Go (adding light!). So, there you have it! Five tips from the experts on how to create the perfect flatlay. There are of course more, but these should get you off to a good start. Do give it a go and let us know how you get on. We’d love to hear from you! Pic Tap Go: Flexible, easy-to-use photo app for transforming your images. Preview: Easy-to-use app for planning and designing your Instagram feed. Avocado Social: Specialist social media consultancy with a range of services to get you social media-savvy. Nancy Straughan: For styling tips, inspiration, styling services and workshops. Capture by Lucy: For digitally printed vinyl backdrops. 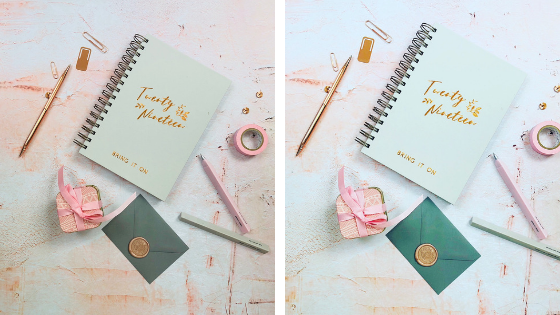 And of course, Martha Brook London for Instagram inspiration but more importantly, beautiful must-have stationery! Left to Right: Stationery heaven; Flowers by Hayford & Rhodes; Martha Brook stationery; Confectionery by Lavolio. Thank you once again to Martha and Nancy for this fabulous workshop and generosity in sharing invaluable tips and tricks – we all enjoyed it immensely.